The National Association of Mining History Organisations (NAMHO) was formed in 1979 to act as the national body for mining history in the UK and Ireland in order to promote education and research in Mining History. Our membership includes more than 50 mining history societies, underground exploration and recording groups, mining museums and corporate bodies. See our list of the current members or the full NAMHO handbook. Any bona fide organisation with an interest in mining history may apply to become a Full Member. (There is no individual membership of NAMHO.) Other organisations which do not qualify under the above, but which are interested in the aims and activities of the Association, may apply to become an Affiliate Member. To act as a single national voice for the benefit of mining history. To provide education to the community at large about all aspects of mining history. To provide assistance to individuals, government bodies and commercial firms in both practical and academic matters relating to mining history. To provide a forum for liaison between our members. 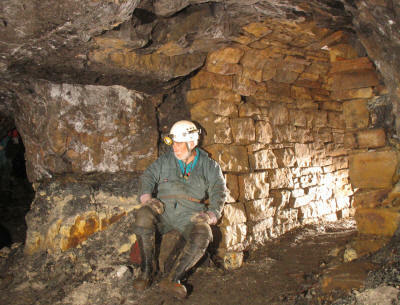 We produce guidelines for those involved in surface or underground industrial archaeology and exploration. We are consulted over planning applications and site scheduling. Not only can we provide archaeological information but also details on the extent and condition of mine workings. Members of NAMHO have served on government committees dealing with mine databases and methods of making entrances safe. NAMHO members also have the skills and experience to visit places safely which otherwise would be inaccessible. We are generally the quickest way of obtaining information on historic mines in the UK and Ireland. The individual members of our organisations hold more information on disused mine sites than any library or record office. If you have a query, we can direct it very quickly to the appropriate organisation or person. We can provide public and private bodies with information on matters of recording, conservation and access. Many of our members are museums and we encourage the interpretation of mining sites for the public. This can vary from un-staffed sites to full-scale theme parks. We are glad to advise any new scheme that involves some aspect of mining. We organise an annual Mining History Conference which is held in different parts of the UK and is hosted by one of our member organisations. It takes place over an extended weekend and events include lectures, seminars and field trips. We liaise closely with the British Caving Association (BCA) on matters of conservation, training and insurance for underground explorers. We provide a means by which members may exchange information and ideas. We produce a regular Newsletter for members in which items of national interest are disseminated. The governing body is the NAMHO Council which meets twice a year. Every Full Member organisation may nominate a representative who is entitled to a single vote at Council meetings. Member organisations may also send non-voting observers to Council meetings. Affiliate Members are entitled to attend the Council meetings but have no vote. Day to day management is carried out by annually elected officers. We do not seek to control the activities of our member organisations, only to act on their behalf. All of our activities are governed by our Constitution.